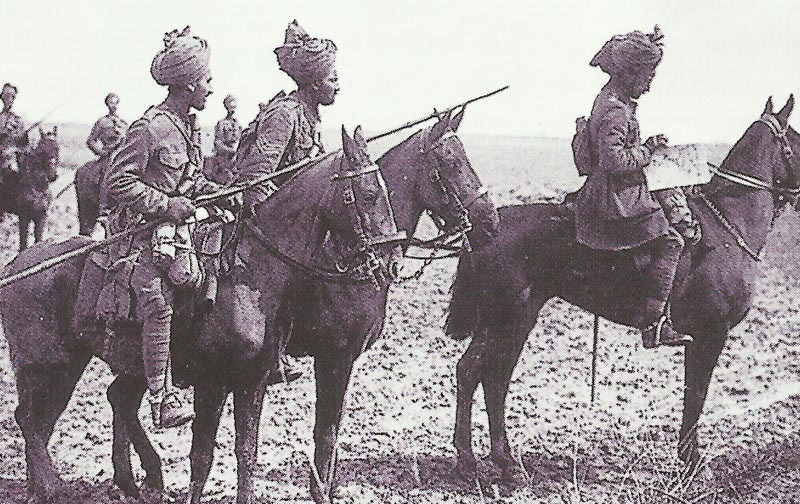 Indian cavalry of the British army, armed with lances. Mesopota­mia – Battle of Shaiba (until April 14) southwest of Basra: 6,156 British soldiers (1,265 casualties) rout 12,000 Turks (3,177 casualties and 2 guns lost). Major Wheeler (7th Hariana Lancers) wins 1st VC (posthumous) of campaign. Britain: Hankey memo warns Asquith about Gallipoli: ‘. . . a gamble upon the supposed shortage of supplies and inferior fighting qualities of the Turkish armies’. Flanders: Unsuccessful German attack near Dixmude. Alsace: French rebuffed southeast of Hartmannsweilerkopf. Cameroons: 80 Germans cut telegraph line in Nigeria. Western Front: French Army airships Adjt Vincent and Conte fly four night missions in April (including on April 29-30), bomb rail targets at Bussigny, Antoiny, Strasbourg, Aulchin, Marley and Aulnoye. Adjt Vincent bombs Douai rail station and junction (night May 11-12). Greece refuses Serb troops railway use. Pope (prayers for peace on April 9) sends peace note to President Wilson. Allies offer Greece Smyrna with hinterland for war against Turkey, Greece rejects on April 14.